The National Digital Library is one of the research, innovation, and creativity environments developed under the strategic policies of the Ministry of Education of Finland. It implements national culture and science policies by increasing the availability of the digital resources of libraries, archives and museums, by developing their long-term preservation, by establishing an important research infrastructure, and by strengthening virtual learning environments. The National Digital Library project is also the Finnish response to the joint objectives of the European Union Member States on digitisation of cultural materials and scientific information, and their electronic availability and long-term preservation. The National Digital Library will serve as the Finnish aggregator for Europeana. to boost national competence in the area of digitisation, online availability and accessibility and long-term preservation. A total of 35 organisations participate in the project: ministries, national institutions in charge of recording and preserving cultural heritage, scientific and public libraries, archives, museums, universities, research institutes, academic associations, and representatives from other key interest groups. The formation of consensus and a new enthusiasm for co-operation between sectors has been the key issue in an undertaking of this magnitude. On project level this has been achieved by cross-sectoral expert groups, using shared tools for project management, interaction and development, and learning from each others' practices. The central funding from the ministry has been the corner stone of this national project. The common standards defined during the project, operational public interface, and projected implementation of the long-term preservation solution should ensure the continuation of the co-operation within the Finnish memory organisation sector after the project is completed. The born-digital and digitised resources on cultural heritage, research, and teaching in Finland will be accessible to end-users through a single interface of integrated services and resources called the Public Interface. The Public Interface will be the primary access point to the resources held by libraries, museums, archives and other information suppliers in Finland. The national view (e.g. the national instance of the Public Interface) will be supplemented with, for example, customised sectoral or institutional views. The operational principle is to continue cataloguing data and keep the digital objects in the back-end systems. Metadata will be automatically harvested to the Public Interface and normalised and indexed for easy and fast retrieval. Harvesting and services will be integrated to the Public Interface through standardised interfaces and access to the digital objects will be provided by persistent links. The systems architecture of the public interface separates the user interface from the back-end systems of organisations. This will facilitate customer oriented services development since more resources can be focused on user interface, services development, and integration. The end-users' needs and expectations have played a major role during the project. Information retrieval systems currently in use are often challenging to use, and some of them require user training before information retrieval is possible. Much of the development work is based on experience gained from research on systems currently in production. The aim is to use the gained experience to develop a comprehensive and multifaceted service with high usability and fast information retrieval functionality available 24/7 anywhere. The system provides functionality for the end user to personalise the user interface to suit his/her needs. Contents of the Public Interface will be digitised or born-digital objects (images, texts, sound files, video clips, e-publications), reference data on physical objects (e.g. artefacts, books, works of art, geographical locations), or other reference data stored in databases. The Public Interface will provide unrestricted material for all users. It will also provide restricted access materials subject to user authentication, such as licensed materials (e.g. e-journals), archive materials with restricted viewing and use, legal deposit copies, and other materials subject to copyright. Since there are several content providers from various sectors, the metadata available will be very heterogenous. This metadata will be harvested from several different back-end systems to a centralised index of the Public Interface. The metadata will be normalised to a common internal format. This means that the Public Interface will accept any type of metadata, as long as the providing organisations have implemented standardised interfaces for harvesting. One of the major challenges of the project is usability. The success of the service depends greatly on its ability to meet the user expectations, which have been outlined in the requirement specifications. Usability considerations focus mostly on the user interface and its functionalities, which should expose the digital content and services within the system and enhance their value. Furthermore, with effective user studies it will also be possible to identify potential future stakeholders and their needs. Usability principles; By following the discourse on the field of HCI as well as the accomplishments of comparable projects, the usability principles for the National Digital Library will be established. Pre-design evaluation; Primary target groups, their roles as service users, and expectations will be described in detail. Particularly, users with vague information needs will be examined. Central use cases and projected information retrieval scenarios will be modelled. The service concept will also be tested among selected target groups. Usability evaluation; Formal usability evaluations will be conducted: one during the piloting phase of the system, and another once the system has been deployed. All evaluations will comprise of a usability analysis and testing of the user interfaces. Tracking and evaluating actual use; In order to provide systematic data for analysing the actual use, usage logs will be collected and recurrent user studies conducted. 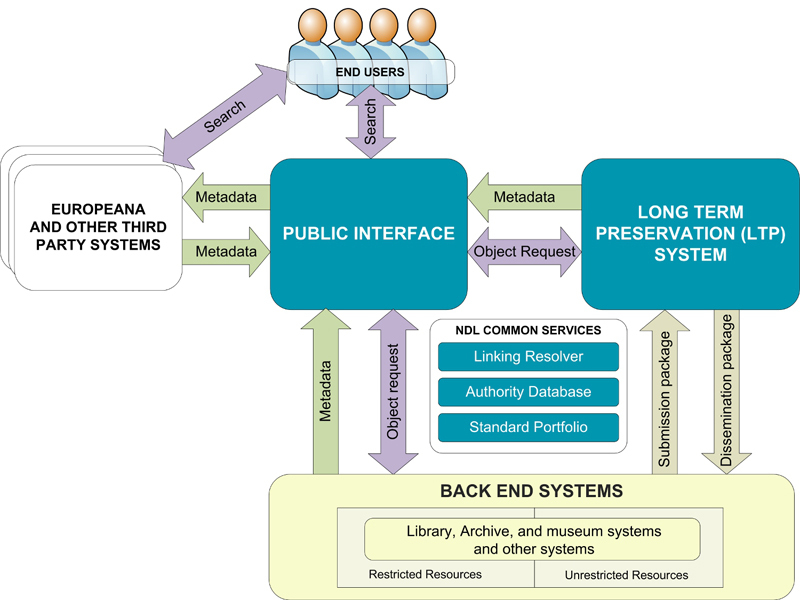 On-line communities of National Digital Library users will be traced, monitored, or founded. User interface design; The project will employ a professional usability engineer for realisation of approved usability design principles, who will participate in all above mentioned usability design phases. The results of these phases will guide the design and implementation of the Public Interface. In addition, they will have some influence on digitisation practices within organisations providing material to the portal. Currently the project is preparing for the pilot phase of the Public Interface which will start after the procurement of the Public Interface software. After the pilot is complete, the Public Interface is expected to be fully implemented and go live on 2011. Plans pertaining to long-term preservation will be completed in the Summer 2010. It is, however, up to the next Finnish Government to set guidelines for its implementation and future funding. During 2011 the NDL will transform from a project to a more sustainable organisation continuing the present work with the entire library, museum and archive sector as an essential part of the ongoing development of the national digital infrastructure. For more information on the National Digital Library and the outcomes, news and other deliverables of the project, see: http://www.kdk2011.fi/en.